We love enjoying nature in our yard and especially the birds. There is something relaxing about watching them flit from here to there while their musical chirps fill the air. If you love watching them too, bird feeders are a great way to invite them into your yard. They don’t have to be fancy! As a matter of fact, I love the fun unique DIY Bird Feeders the most! So far, the birds have not complained except when they get empty 🙂 Today, we wanted to share a few DIY Bird Feeders with you so you can enjoy our feathered friends too! And, remember, putting out seeds during the winter is especially important as food is harder to come by for them. You may also want to check out these ideas to brighten up your Winter garden too. It’s a great way to enjoy the outdoors and wildlife year round! This Orange Bird Feeder from Sheri Silver is so much fun! Who would have thought that you could create a bird feeder out of something you normally throw away?! Hang them on trees and shrubs that are easily viewed from your window, so you can watch the birds come and feast! 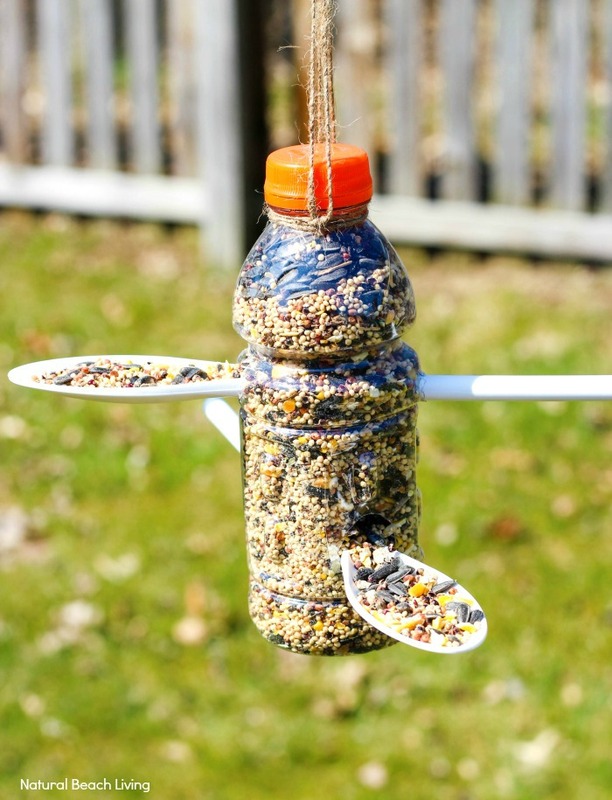 I love this easy Plastic Bottle Bird Feeder from Natural Beach Living! It is a great bird feeder idea and recycles those plastic bottles around the house! This simple craft only takes 10 minutes to make and then sit back and watch the birds enjoy! I think it would be true if I said most of us have old china cups and saucers lingering in our cabinets, right? 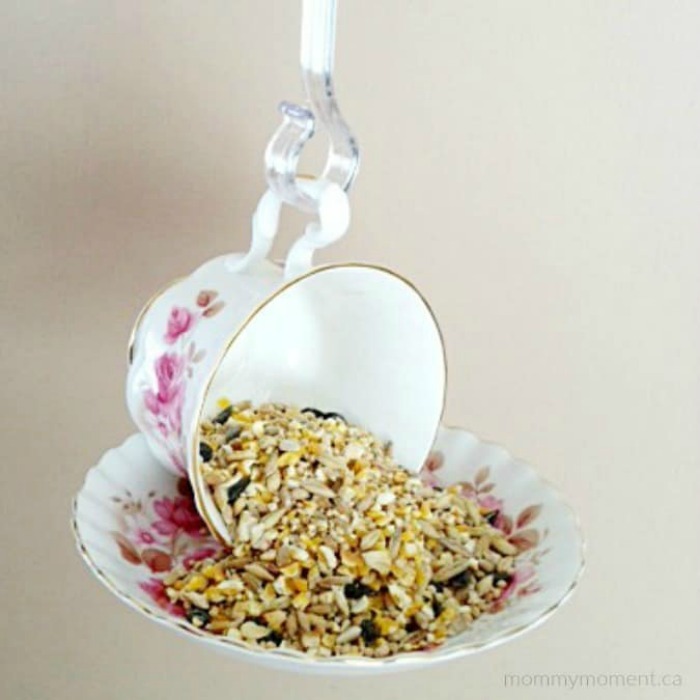 Put them to use with this easy DIY Tea Cup Bird Feeder by Mommy Moment! Super easy, super quick, and oh so cute! 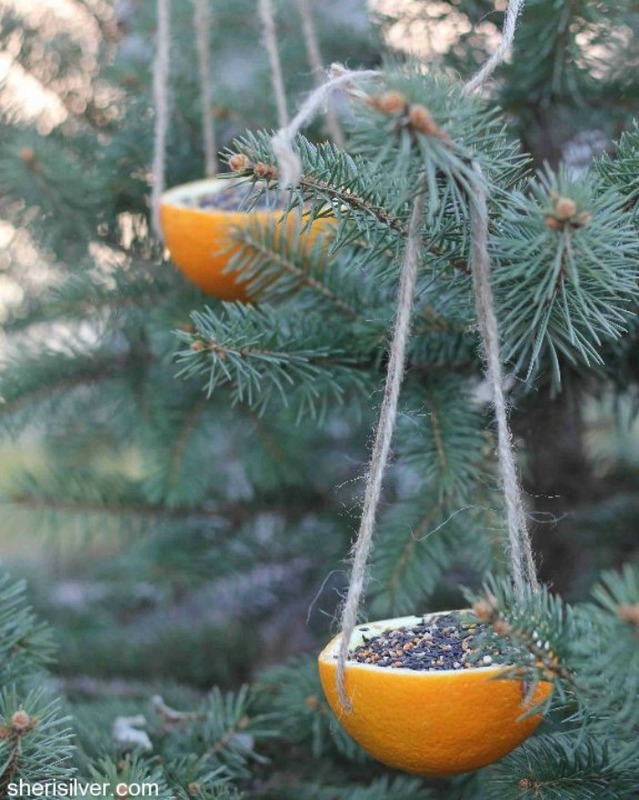 Get the kids involved with these easy Bird Seed Ornaments from Crafts by Amanda! 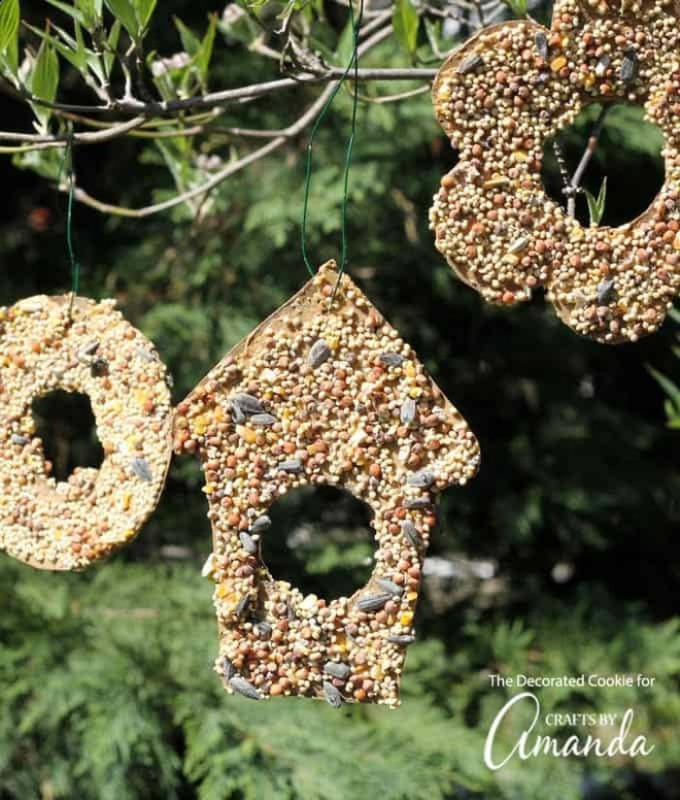 You can make your ornament any shape you like; just be sure to cut a circle in the center so the birds can perch while they dine on delicious birdseed. All you need is some thin cardboard, peanut butter (the Audubon Society assures us that peanut butter is safe for birds), and birdseed. Attract Beautiful Feathered Friends with these Easy DIY Bird Feeders! Click on the images below to explore these 22 Easy DIY Bird Feeders from our friends! Please leave a comment on your favorites so our bloggy friends know you found them at It’s Free at Last! ~ Enjoy creating! Love this! Pinning for future reference. We make our own suet cakes which the birds totally love.